From Jacksonville to Miami to Key West, interior designers, architects and builders each have their own take on coastal style - from laid back to sophisticated, bold to neutral. Their unique perspectives combined with a rainbow of Vetrazzo colors help these professionals capture in their designs what we all love about the Sunshine State - the luminous color of those bright skies, swaying palms and sparkling waters. Serving this community of style influencers in the luxury market, is UMI, Florida’s largest source for natural stone, quartz, porcelain, and recycled glass surfaces. “We began our business almost 20 years when as fabricators and installers we saw a need in the market for more unique materials for residential and commercial projects. Over the years we’ve moved from fabrication to distribution,” said Don Di Norcia, President of UMI. Di Norcia and his team now operate locations in Naples, Tampa, and Boynton Beach. The four new colorways of Vetrazzo by Laura U are part of the Designer Collection available at UMI. There’s no doubt that in Florida environment influences style, (how could it not when the sun is shining and the water glistening? ), but the diverse locations, from city to suburb to coastal hideaway, mean the state has styles as dynamic and diverse as its residents. We love what Rob Goldberg, Executive vice president of marketing for the iconic Florida brand Tommy Bahama had to say about style here. 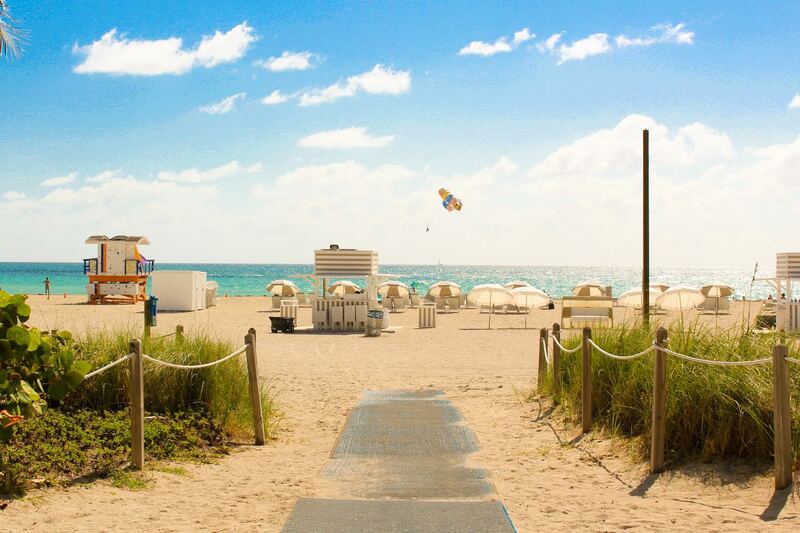 “From a design perspective, there’s South Beach, the Gulf Coast, North Coast … all have different sensibilities, yet all come back to the same foundation and theme: a lifestyle that’s a little slower, easier and more relaxed,” he said. Pensacola based designer Cheryl Kees Clendenon of InDetail Interiors, who works in Florida and around the country, likes to incorporate subtle coastal themes that are an homage to their surroundings. This get away home master bath remodel by InDetail Interiors features an Emerald Coast recycled vanity top and textured cabinetry.  It’s one reason that Clendenon says she’s a fan of Vetrazzo where the luxe look meets the coastal vibe. See her coastal chic Perdido bathroom here. 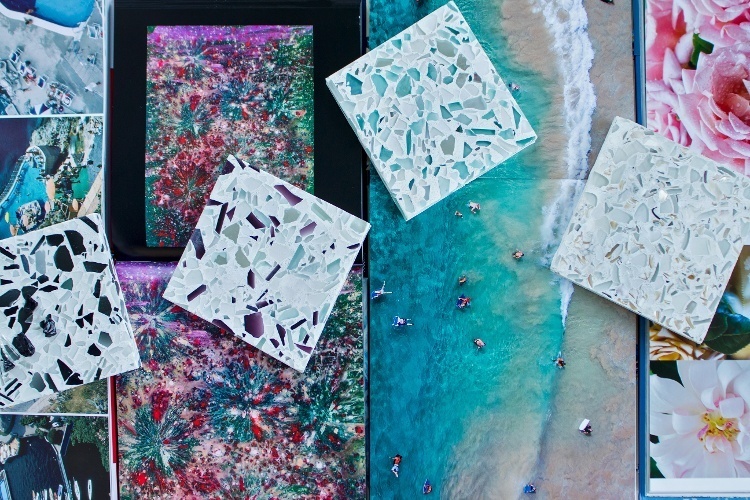 As Florida’s demand for unique modern surfaces has grown, UMI has expanded its recycled glass countertop offerings to include four new colors, a designer collection with new profile options from 3 cm to ultra-thin 1 cm, and the new Sea Pearl finish, with the texture of beach glass and the opalescent quality of a pearl, rising to the surface of sand. In the Sea Pearl finish (shown here in Floating Blue) pieces of glass seem to rise up gently out of the concrete surface with the texture of a worn piece of sea glass. “Sea Pearl is the Florida lifestyle in a countertop - high end style, in a relaxed design, with a strong connection to the ocean. Our customers gravitate to it for the look, and then fall in love with the texture.” Alex Ferraz Director of Sales and Business Development at UMI. It was the same story for designer Amanda Webster for the Ponte Vedra bathroom she designed for a beach loving couple. “I love that you can see right down into it and some of the chunks are really large, so you can see about a half-inch deep. The first thing [people] do is go over to the countertop, start touching it and go, Wow, what is this? !,” Webster said. With Vetrazzo, it’s always about color, and seeing it in person is key to selecting the recycled glass color that matches the project’s inspiration. For Webster and her clients that meant starting with beach treasures. 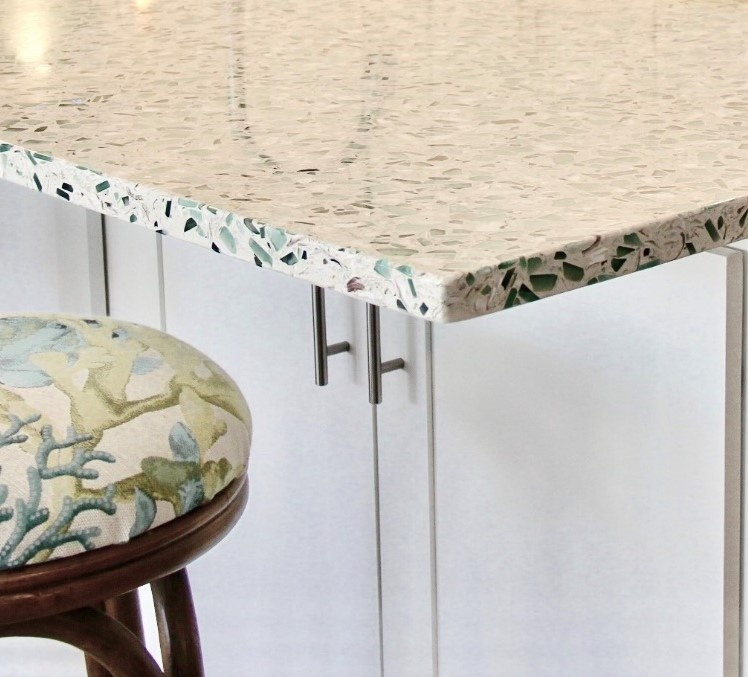 Emerald Coast incorporates bits of oyster shell for a subtle coastal reference. At UMI’s showroom Ferraz and his associates help designers and homeowners select from the 26 available recycled glass colors to find that one meant to be their design’s centerpiece. See more colorful recycled glass designs for bathrooms, kitchens and even restaurants in UMI’s Coastal Luxe Lookbook.